I didn't really realize until I was editing and uploading the picture for this card that I have some crazy sunlight coming into my art room in the mornings. You can really see the shadows on the left of the sequins and the raised greeting. I had no idea! Anyway... I needed (yet another) birthday card but didn't really have a plan. So the plan I went with involved using the stuff that was already on my desk because I was too lazy to put it away the night before. The only thing I had to get out was the rectangle die, because I never leave dies out. Mostly. To create this card, I began by stamping the middle flower on Copic friendly paper, masking it off and stamping the one above and below it. Then masking those off and stamping the top and the bottom flower. I then die cut the panel using my largest stitched rectangle die and die cutting the greeting several times to layer it up. I coloured the flowers in with Copic markers using a very gentle hand, and coloured the top layer of my greeting using my darkest Copic colour. I adhered the greeting down using Tombow Mono Multi glue, and the sequins down with Ranger Multi Medium Matte to make sure they weren't going anywhere. Great job putting your color palette together by coloring that greeting with your Copics, what a great idea! Pretty card with lovely details. Thanks for taking TIME OUT and joining our challenge! I love the soft peach colour you used on your card. Just realised its the same as your blog page, is this your favourite colour?? Its so pretty and feminine. Really like how you coloured and masked your flowers and the sentiment is nearly jumping off the card in that light. 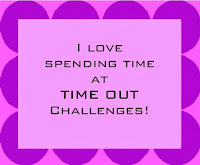 Thank you so much for joining us at TIME OUT!!! !